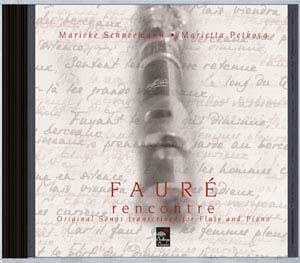 On this album flutist Marieke Schneemann and pianist Marietta Petkova play songs by Gabriël Fauré in version for flute and piano. There is something exaggerated in the combination of the cycle's title, "Poem of a day," and the depiction of an entire cycle of a disappointed love -- delirious idealization, romantic despair as the ideal is shattered, and finally cool indifference -- events that typically require more than 24 hours' evolution. Fauré's setting captures this exaggerated sensibility, but without the sentimentality that, for example, his compatriot Massenet lavished on his opera of obsessive sensibility, Werther. The first song, "Rencontre," begins in a kind of rapt wonder, with arpeggios swooping upwards in the accompaniment and the vocal line marked dolce. The two verses are close to identical, climaxing in an ecstatic mezzo forte high note expanding to forte before the concluding phrase. The quick tempo and fast motion in the accompaniment give the song the same rushing sense that the poem conveys, the instant infatuation before even knowing the beloved one. Over a rapidly purling accompaniment in triplets, leggiero e legato, an effusively brilliant melodic line whips the clichés of Armand Silvestre's inclusive poem into a froth thrice repeated -- "Our love is a light thing ... Our love is a charming thing ... Our love is a sacred thing ... " -- before working the two final stanzas -- "Our love is an infinite thing ... Our love is an eternal thing ... " -- to a sweeping apotheosis rising to B above the staff. Repetition through the first three stanzas is justified by the intricacy of the melody, which teases the ear in such a way that one welcomes its return. One is thus prepared for the variations wrought upon it as Fauré rises to the notions of infinity and eternity. Composed about 1879, "Notre amour" is contemporary with the Ballade for piano and the Élégie for cello and piano while providing a scintillating foil for its opus companion, Les Berceaux. Which is to say that Notre amour catches Fauré in full stride as "the master of charms" (as Debussy somewhat slightingly called him) before his discovery of Paul Verlaine's poetry deepened and enriched his art. The sheer number and breadth of Gabriel Fauré's songs make generalizations difficult, but one aspect frequently noted is his tendency to forgo the narrative particulars of pictorialism. His music, with its slippery post-romantic harmonies and cursive melodies, seeks to resonate alongside his chosen texts with some essence underlying both. Such is the case with Au cimetière (In the Cemetery), composed and published as the second song in Fauré's Op. 51 in 1888 (and later included as the second song in the last of Fauré's three-volume song collection in 1908). Although clear affinities can be drawn between text and tone -- the steady chords associated with the land, for example, that into arpeggios as the scene shifts to the sea -- Fauré's haunting setting of Jean Richepin's text from "La Mer" seeks to evoke rather than depict; that is, he chooses his music for the same reasons the poet chooses his symbols, both of them striving to grasp something deeper. The first strophe of the song begins with stark, hushed E minor chords that cast a faint pall on the melody as it enters. Taking a cue from the somber music, the speaker describes a cemetery and speaks of death. The mood is one of repose, however, rather than anguish -- the departed "sleeps a vermilion slumber beneath the brilliant sky" -- and is soon conveyed as well by the repeated chords, which slowly rise heavenward with the contour of the melody and nearly attain a more optimistic major mode before settling back into minor at the verse's end. The second verse is more emotionally taut: loved ones are at the graveside, now, kneeling, "his bones, there beneath the flowers...bathed by their tears." Fauré's harmonies wander more erratically now, the bassline of the accompaniment dipping ever lower to begin its ponderous stepward ascents. The fluidity of the melodic line in the first two verses sets in relief the rigidity and irresolution of the melody of third, which begins with loud, strident chords and ardent repeated notes in the upper register of the voice, inflected only by semitone alternations. The scene in the text turns from melancholy to gruesome as the singer laments the fate of those not fortunate enough to be buried on land, the perished sailor who languishes in the depths of the sea "tossed, naked and forgotten, their eyes still big and unblinking." Le papillon et la fleur (The Butterfly and the Flower) dates from very early in the career of Gabriel Fauréand was, in fact, his first published composition (Op. 1/1, 1965). The song, or mélodie, as Fauré took to calling them, is clearly a skillful rendering of Victor Hugo's poignantly quaint poem, but follows largely after the Germanic style of mid-century and only hints at Fauré's later, more languorous style. The poem depicts the amorous entreaties of a flower to the butterfly that visits it, the former bemoaning how widely the latter roams free, untethered by roots in the soil, visiting countless other flowers. The poem unrolls in a singsong manner, with clear rhyme and meter, suggesting a similarly straightforward setting. Fauré is thus limited in the extent to which any particular sentiment or feature of the text can find resonance with the music, although his simple strophic structure is certainly not lacking in charm. Indeed, the sturdy bassline underscoring the melody and the cascading figure in the right hand that serves as an interlude between strophes aptly conveys the coy romantic humor of the poet's transparent metaphor. Fauré's later mélodie, of course, become more harmonically complex, structurally varied, and intellectually engaging, but not necessarily more endearing. In Fauré's setting of Les Présents -- the first of his Two Songs, Op. 46 (1887) -- Villiers de l'Isle Adam's elusive poetry seems to hover between joy and sadness, twilight, and myth. The Watteaupaysage of its companion, Clair de lune -- Fauré's first Verlaine setting -- is enveloped in the moonlight of pure fantasy as archetypal stick-figure masqueraders "Play the lute and dance/And are almost sad under their fantastic disguises!" An impassive vocal line croons in merely occasional agreement with the piano's quasi-plucked accompaniment, which is caught up and engulfed in an archaic minuet which eventually gives way to arpeggiated rapport with the vocal line before the suddenly enchanted exclamation "Au calme clair de lune, triste et beau...." Soon, though, the minuet returns to reach its cadence. Clair de lune represents Fauré's first excursion into the ideal landscape to which he would return several times as a supreme master of the mélodie -- notably, in the Mélodies de Venise, Op. 58 (1891), La Bonne Chanson, Op. 61 (1892-1894), and the fantastic divertissement Masques et bergamasques, Op. 112 (1919), in which Clair de lune would find its predestined place. By contrast, Debussy's second, more successful setting of Clair de lune, from his first collection of Fêtes galantes (1891), perhaps protests too much in sensuous striving to evoke a realm which Fauré calls up persuasively in a subtle, deceptively simple fait accompli. Fleur jetée is the second of the four songs in Gabriel Fauré's Op. 39, completed in 1884. This collection is considered by some to be among Fauré's lesser works; after all, he is often criticized for including in his substantial body of art songs, alongside settings of acclaimed authors like Paul Verlaine and Victor Hugo, renderings of texts by lesser or popular poets such as Armand Silvestre and Leconte de Lisle. Silvestre, in fact, provides poems for three of the songs in the Op. 39, including Fleur jetée, and while the song certainly cannot entirely escape the poet's rather melodramatic tone (melodramatic to modern ears, anyway) and arguably overripe metaphors, Fauré's acute sense of musical expression and skill at harmonic nuance convincingly renders the poem. The musical surface of Fleur jetée (Discarded Flower) is rather more turbulent than one might expect from Fauré, with its uninterrupted strings of repeated chords in F minor, its tidal dynamics, and the rising and falling gestures in the base that punctuate the gaps in vocal phrases. There is perhaps an explicit pictorial element associated with the image of the cut and withering flower, and the abrupt alternation between right and left hands of the repeated chord texture at the song's midpoint. As the texture fractures, the chordal progressions as well grow more conflicted, with increasingly chromatic harmonies underscoring an increasingly agitated melody. Carried along by the "wind that dries you up/poor flower," the arching contours of the melody reaching continually higher peaks. The line seems bound by the upper ceiling of the F minor tonality, however, reaching further upward with each appearance of the word "wind," but failing to break past the high F. Finally, at the work's climax, propelled by a sudden shift to F sharp major and a momentary elongation of the meter from 6/8 to 9/8, the voice stretches a semitone beyond its upper limit, once again gusting upward a final time on the "wind...that withers you...[and] withers my heart." Gabriel Fauré's "Les berceaux," Op. 23/1 (1879), a setting of a poem by Sully Prudhomme, uses a flowing melodic line in the vocal part and a characteristic accompaniment in the piano to evoke the movement of both ships and of cradles (berceaux), linking the two together in motion and emotion. The poem describes large ships rocked by the water and cradles rocked by women: "But the day of farewells will come, because women must weep, and curious men must dare the lure of the horizon." But though ships carry men away from their cradles, the ships sense, and are momentarily held back by, the soul of the cradles. The song opens with the lulling motion of arpeggios in the piano bass line, underpinning a soothing, quietly sung vocal line. At the line "But the day of farewells will come, " a crescendo slowly builds to a forte climax on "dare the lure of the horizon." The piano leads the way back to the more flowing sprit of the opening, ending the song in the tone in which it began. Gabriel Fauré's "Après un rêve," Op. 7/1, a setting of an anonymous poem translated by Romain Bussine, is one of the composer's best-known works for voice. The text describes a dream in which the narrator and her beloved come together in an almost otherworldly meeting, followed by a longing to return to this dream state after awakening: "In a sleep which your image charmed, I dreamt of happiness, ardent mirage.... You called me, and I left the earth, to flee with you towards the light.... Return, return, radiant, mysterious night!" Though light, the piano accompaniment provides an underlying pulse, lending the song a sense of propulsion; at the same time, the vocal line is appropriately dreamy and languid. While the vocal range is not especially demanding, the accompaniment provides little pitch support for the voice's sometimes unusual intervals. When well performed, this richly expressive song is one of the most impressive and moving in the entire repertoire. The second, the only song in the cycle in a minor key, is much faster, allegro con fuoco, and even violent in the passionate phrasing. Typically Fauré's songs are sung piano, with occasional mezzo fortes or fortes, but here he wrote the opposite, with most of the vocal lines in a raging forte, complete, of course, with lavish high notes and octave leaps. There are relatively few rests in the relatively long vocal lines, further enhancing the impression of a near-breathless outburst. Again, the two verses are more or less similar. The majority of works in Gabriel Fauré's extensive body of solo songs were written as individual pieces, concentrated evocations of solitary moods and notions. A number of Fauré's songs, however, are gathered into extended cycles with a broader aesthetic scope. To this latter group belongs En sourdine, the second of Fauré's Mélodies (5) "de Venice," Op. 58 (Five Venetian Melodies). The cycle was undertaken in the summer of 1891 in the city of its name and was later completed Paris -- the title referring not to the provenance of the tunes themselves, but to the composer's location at the time he commenced work on them. In fact, Fauré probably did not begin composing En sourdine until he was back in Paris, an observation that only highlights the lack of particularly Italianate features in the music and the overwhelmingly French character of both the text and its setting. The words of En sourdine, like those of the other songs in the cycle, are those of the eminent poet Paul Verlaine, a writer especially favored by Fauré (as well as others -- at least ten settings exist of this poem alone). Fauré's selection of the poem, and his musical realization of it, evince the frequent observation that the composer often sought out texts with deliberately vague narrative trajectories and few pictoriable images, choosing instead poems that conveyed vivid but ineffable images through veiled webs of connotation, undulating phonetic surfaces, and amorphous analogies. The title, after all, translates as muted, and the first strophe seeks after the "profound silence" to be found in nature. A breeze blows throughout the score, with its constant rising and falling arpeggios, even though it appears in the text only near the end. The undulating textures and drifting harmonies underscore the sensorial detachment and sense of abandon in Verlaine's poem, which speaks of "half-light," "eyes half closed," and "vague weariness." The penultimate stanza, "persuaded by the softly rocking breeze," musters a hint of volition in the form of a meandering countermelody in the piano that escapes from the accompanimental texture and floats upward into the singer's company before receding again into the song's quieting final bars. Fauré characteristically leaves the poem's final, poignant image unsullied by musical tethers: as Verlaine said and Fauré concurred, only after the darkness falls, represented by the singer's last strains and the disappearance of the piano's hushed final chords, will the nightingale sing. These songs are nearly unique among Faure's writings, for having no dedication, probably due to the nature of the first work. Prison is a setting of a poem that Paul Verlaine wrote while himself in prison after having attempted to kill his friend and fellow poet, Arthur Rimbaud. Faure, who set several of Verlaine's poems (Clair de lune, Spleen, Cinq melodies de Venise, and La bonne chanson) during the late 1880s, made his setting of this poem one of his most dramatic and emotional, each note tied especially closely to the moods of the text, from the first quiet contemplation of the serenity in the world outside the prison, to the agonized and desperate unanswerable questions of the ending, sinking into a quiet sense of loss and grief. While Faure rarely tried to link the songs gathered together into the various opuses, except, of course, when writing a song cycle, in "Soir" he did choose a text expressing a certain level of sadness, though here alleviated by love and by thoughts of compassion, in contrast to the first work. The first two stanzas are marked by his typical sensual lyricism, the last becoming more intense as the poem declares, "C'est la pitie," the emotion that Faure must have felt and certainly expressed in his setting of "Prison." Mandoline is the first of Gabriel Fauré's Mélodies (5) de Venise (Five Venetian Melodies), and in fact, the only one of the five to truthfully lay claim to its eponymous provenance: Fauré completed the song in the summer of 1891 during a stay in Venice, but wrote the rest of the songs in the cycle, and published the set, later that year in Paris. At any rate, the entire cycle bears the unmistakably French character of Fauré's adventurous but never overbearing harmonies, his translucent textures, and his emotionally direct melodic contours. The text, like the others in the cycle, is taken from Paul Verlaine, whose poems make up a large portion of the words set to music by fin de siècle composers. (Mandoline, in fact, had already been set by Debussy a year before Fauré's Mélodies (5)). Fauré uses the song to inaugurate his cycle with a bright, nimble mood (contrasting sharply, for example, with the textural moiré and veiled gestures of the second song, En sourdine). Repeated chords and jaunty rhythms form the core of the accompaniment, undergirding a lyrical line in the voice. Though Fauré generally shied away from blatant tone painting, the rhythmic character and plucky articulation of the piano clearly evoke the serenade singers described by Verlaine. The mood is light, as the poet notices figures in the crowd, describes their clothes, and gives listeners a glimpse of personality; the poem, as a character scene, offers Fauré the kind of poetic obligation he most enjoys meeting: a study in the evocation of subtle metaphor and the acute emotional resonance of a fluid narrative. As the scene progresses, Fauré extends the curve of his melodic arcs and infuses his harmonic progressions with greater leeway -- the mandolin itself finally making its premiere in Verlaine's fourth stanza; but in the end, Fauré returns to the light texture and coyly self-conscious prattle of the opening verse. The last song returns to the major key. This is almost a précis of the emotional journey of the cycle. The tone of this song is more or less dispassionate, with both voice and accompaniment moving in more or less scalar steps until the word "fumee," with the upward fourth and the following piano arpeggio suggesting smoke blowing away, followed by the key change. But even in the brief section before the repeat of the first theme, while there are wider intervals and even a mezzo forte on "fleurs," and a slightly more restless accompaniment, after the change back to the original key and vocal theme, the accompaniment even takes on a lightly accented syncopation, adding to the effect of near-carelessness.